Enterprises, content providers, data center operators, mobile operators, and retail service providers all want to have the right capacity between the right locations at the right time, easily and cost-effectively. Cloud-based providers offer these type of services cost-effectively. Can network service providers compete? With Blue Planet Multi-Domain Service Orchestration (MDSO), network service providers can automate provisioning of bandwidth on demand services—giving their customers the flexibility to adapt to market demands quickly. The Blue Planet solution automates end-to-end path computation and provisioning connections, on demand, across multi-vendor, multi-domain infrastructure. Open REST APIs for integration with OSS/BSS, such as the Order Management System (OMS), through which the on-demand service fulfillment process is initiated. Resource Adapters (RAs) provide an abstraction layer from a common information model to communicate with a wide variety of network elements and/or domain controllers, regardless of vendor or native protocol. Intent-based orchestration using TOSCA-based service templates, which allow network operators to create and deploy services by declaring the service intent at a high level, rather than with a series of detailed provisioning commands. 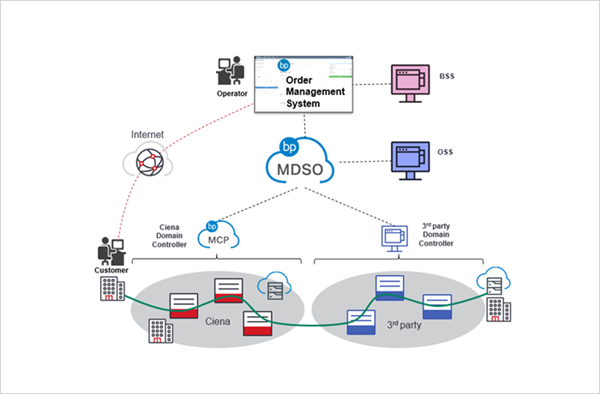 Once the OMS sends the customer-specified endpoints and service parameters over its open REST API to Blue Planet MDSO, MDSO’s intent-based orchestration automatically provisions the service end-to-end, at the specified activation day and time. This relieves network operators of the tedious, error-prone, and time-consuming tasks. With the Blue Planet Bandwidth on Demand solution, customers gain self-serve portal options to dynamically adjust their bandwidth, as they need it. Behind the scenes, the many steps involved in the service fulfillment process are greatly simplified, thus reducing manual effort and total OPEX for the network service provider, and decreasing the time interval from quote to cash.